One of Steve's top-priority requests for our Italy vacation was a wine tour in Tuscany. We booked the Chianti Wine and Food Safari offered through Walkabout Florence--and it was hands-down one of the highlights of our trip. Even for me, and I don't particularly care for wine! Fortunately for us, September is grape harvest time. The postcard-worthy scenes everywhere we turned were made even more picturesque by the fact that all the vines were heavy with ripe grapes! After a long, exhausting introduction to Florence, a guided tour for our second day was exactly what we needed. It was so relaxing and fun to show up at the meeting time, get on a minibus, and not have to make any decisions or figure anything else out the rest of the day--just enjoy wine and food, learn about the region's history and culture, and absorb the beauty of our surroundings. I literally have over a hundred pictures from this day, so it was a challenge to choose just a few to share with you! This minibus is smaller than the picture makes it look, I think. There were probably around two dozen people on the tour. Our guide, Martina, was everything a tour guide should be: funny, charming, knowledgeable, full of interesting stories, hospitable and quick to put everyone at ease. Listening to her all day was a delight! Many people on our tour had been on other tours and said this was by far the best. This is the only decent photo I have of Martina, and it's misleading--she was much more cheerful and upbeat than she looks here! Our first stop was Villa Le Corti, a wine estate owned by one of Italy's most prestigious aristocratic families (Principe Corsini). 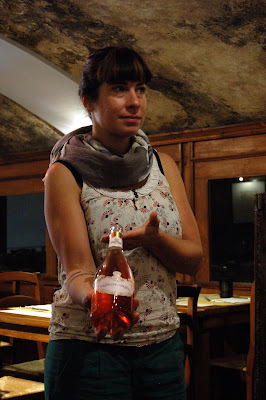 ...as well as a tour of the olive mill, where we learned all about olive oil production, we tasted three Chianti wines paired with Pecorino (sheep's milk) cheese. Martina has received extensive training and certification as a sommelier, so she had lots to teach us about the wines and the art of wine tasting. In order to be called a Chianti, the wine has to be produced in the region and made from at least 80% Sangiovese grapes. Before leaving the estate, we toured the gardens, and then we got back on our bus for a drive through the countryside on remote, winding roads. The scenery was spectacular--vineyards and olive groves, farms and churches and monasteries. From there we drove to Greve in Chianti, a little village where we had about an hour to wander around the piazza at our leisure. My hand (which is large) in the photo for scale--and what you can't see is that it's also as thick as my thumb is long! Our last stop was a smaller winery called Villa Cinciano, also picture-perfect. Here we tasted three more wines and also got to sample the cured meats: salami, prosciutto, and cinghiale (wild boar sausage). I seriously cannot say enough about this tour. It was our one big splurge for the trip and totally worth it! Even though I didn't love any of the wines we tasted, Steve enjoyed them, and the food was amazing. In addition to the scenery, we both geek out on history and culture, and Martina told us dozens of funny and/or fascinating stories about Tuscan/Florentine history. And as I said before, a guided all-day (about ten hours) tour was exactly what we needed as a break from planning and executing each day's itinerary ourselves. We highly, highly recommend it!